Have you got a rusting pile of junk sat on your driveway? Yep, us too. Well, we used to anyway. It was an old Ford Cortina, slowly falling apart from the seems. 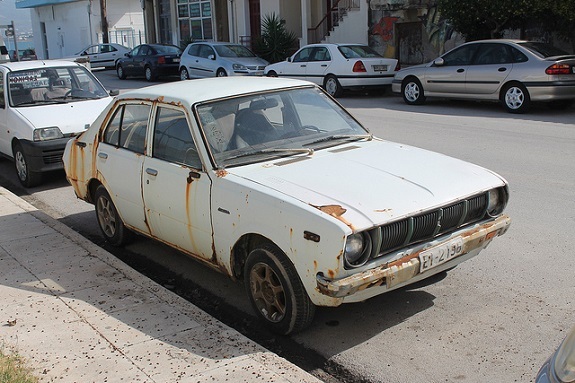 There’s a fine line between ‘classic car’ and ‘heap of rust’. Unfortunately, ours fell quite heavily on the ‘heap of rust’ side. The car itself wasn’t a write-off. It drove well, and it powered through, but we failed to keep on top of the regular maintenance. Plus, we had our eye on something new. If you’re in a similar position, your first step is getting that car off your drive. You need to sell it, and move on to a new model. Only then can you get the car you really love. Unfortunately, it’s not always easy getting rid of an older car. Here are some of the options we considered. Part-exchange – One of the quickest and easiest ways to offload your old car is through a part-exchange. That means trading in your old car as part of the deal for the new one. They’ll deduct the sale price from the cost of your new vehicle. The best thing about part-exchange is that you can get it all over and done with in one transaction. Get rid of the old car, drive away in the new one. The downside is that you won’t always get the best deal. Private sale – A private sale is – by far – the most lucrative way to offload your motor. If you’re willing to put in the time and effort, you’ll get the best possible price on your vehicle here. You can start by advertising in the local newspapers and wanted ads. You can also use the internet, and take advantage of online car auction and listings sites. It’s up to you to manage the sale, meet buyers, and negotiate the final price. The process can take a while, but in some cases it’s worth it for the extra money. Sell to a secondhand dealer – Another option is shopping it around the dealerships for the best price. This option isn’t quite as lucrative as the private market, but it’s a lot less effort. Take the car to four or five local dealers, and get a quote or valuation for each. Sell it to the highest bidder, and they’ll take it straight off your hands. Donation – Rather than go through the process of selling something that isn’t worth much, why not donate the car? The folks at Veteran Car Donations tell us that even an old car goes a long way. Donating your vehicle helps those in need, and will improve the lives of many. If your car isn’t worth much on the market, consider taking the kinder option. Scrap it – Of course, the final option is to simply scrap the hunk of junk! If the car will cost more than its sale value to fix, then it’s a write-off. No dealer will touch it, and no respecting buyer will consider taking it on. In this case, it’s best to bite the bullet, and feed it to the steel grinder. The scrap yard might even give you a little money for the privilege.